The games are adaptations of the novel rather than the 2001 film of the same name. The video game includes sections of the novel that were not included in the movie, such as Frodo Baggin s encounter with Tom Bombadil. Thus the games are not in the same series as The Lord of the Rings: The Two Towers and The Lord of the Rings: The Return of the King by Electronic Arts, which are based upon the two films of the same names from The Lord of the Rings film trilogy. The Lord of the Rings: The Two Towers also contained some levels set in The Lord of the Rings: The Fellowship of the Ring. The three playable characters in the game are Aragorn, Gandalf and Frodo Baggins. Each with their own weapons (which vary throughout the game). Frodo uses 3 melee weapons at different stages in the game: a walking stick at the start of the game, a dagger (from the Barrow Downs) and a short sword, Sting which is given to him by Bilbo. Frodo can also pick up stones and shoot them in a ranged attack, as well as utilising the Ring to give him invisibility. Aragorn uses a long sword, Andúril, and a bow. He could also use a fish called Xiphidae, a secret weapon found on the last level. Gandalf uses his sword Glamdring and his array of magical spells: Fire Blast, Staff Strike, Chain Lightning, Heal, and Attract. The enemies in the game are: Barrow-Wights, Black riders, Ruffians, cave-trolls, stone trolls, Orcs, Goblins, Uruk-hai and wolves. The bosses in the game are the Balrog, the Old Barrow-wight, the Fell beast, Bill Ferny, Harry Goatleaf, Old Man Willow, Nazgûl and the Watcher in the Water. The narrative of the game can be roughly divided into four acts, each played by out by one of the three main characters, with some variation. The first act deals with Frodo's journey to Bree. It begins peaceably in the Shire as Frodo has to make the final arrangements for his departure. Although there are many optional quests involving the inhabitants of Bywater and Hobbiton, the main story focuses on the selling of Bag End. Once this is complete and the Ring is retrieved Frodo must escape the Shire undetected by Black Riders to meet with his companions and Maggot's Farm. Frodo must find Merry, Sam and Pippin who have lost themselves in a fores labyrinth. He must them free Merry and Pippin from the clutches of Old Man Willow. Finally Tom Bombadil intervene, rescuing the Hobbits and setting them off in search of 12 water lilies. Once recovered Tom takes them to his house to recuperate. Frodo's companions are again lost and Frodo has to find them in the fog of the wight-haunted downs. In the final barrow Frodo finds his new weapon, the Westernesse Dagger, and uses it to defeat the Barrow Wight Boss with the help of Tom, who guides the hobbits to Bree. Act Two starts in Bree when it is apparent that Merry is missing and gameplay switches to Aragorn. Having found Merry he then hunts for objects to construct Hobbit decoys to fool the Nazgûl who are still on their trail, battling wolves and ruffians along the way. Aragorn escorts Frodo and Sam to the summit of Weathertop. On the way Wargs and Orcs are first introduced into the game. Aragorn must battle troll on the summit before returning to the campsite to protect Frodo from the attacks of the Ringwraiths armed with a burning brand. Act 3 begins with Gandalf as the playable character as he searches for the doors of Moria. As he attempts to open them, play switches to Aragorn as he fends off the Watcher in the Water before returning to Gandalf on entering Moria. With Gimli the dwarf as a companion, Gandalf must navigate the dark maze of the Dwarrowdelf fighting off the orcs and trolls that stalk its shadows. The game becomes more objective based when the Fellowship reaches Balin's Tomb from which Gandalf must find an escape route as the other characters fend of trolls. Play then switches to Frodo in the 21st hall, retaining Gimli as a companion, who must find a way through the various ladders, walkways and bridges to reach and open the gates on the other side. Act 3 reaches its conclusion on the bridge of Khazad-dûm where Gandalf duels with Moria boss the Balrog. Act 4 sees Aragorn resume the role of playable character after a brief interlude in Lothlórien. First there is a short level in which he spies out an orc-dam on the river Anduin in which the game introduces its final minor enemy, the Uruk-hai. Play then moves onto the final level of the game at Amon Hen in which Aragorn battles his way through most of the previously-encountered enemies to the Seeing Seat. The very summit has to be reached twice, first as Frodo and then as Aragorn, before Aragorn battles the Games final boss, the Fell Beast. A Game Boy Advance version was later released in September 2002 to North American audiences, and to Europe two months later. It greatly differed from its counterparts on other consoles, most notably for its RPG-style battle system. However, the game was poorly received by critics. Most of the complaints came from the extremely slow gameplay. It was also notorious for its poor quality; the game contained many glitches which greatly hindered the player's progress and sometimes even forced them to restart the entire game. 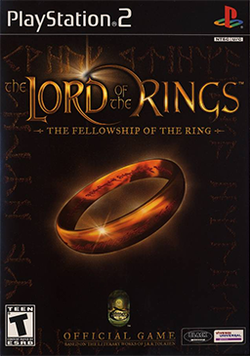 A sequel was planned for this game, and was to be titled The Lord of the Rings: The Treason of Isengard, which was a discarded title for the book The Two Towers. The game was in development, but was cancelled before its release.